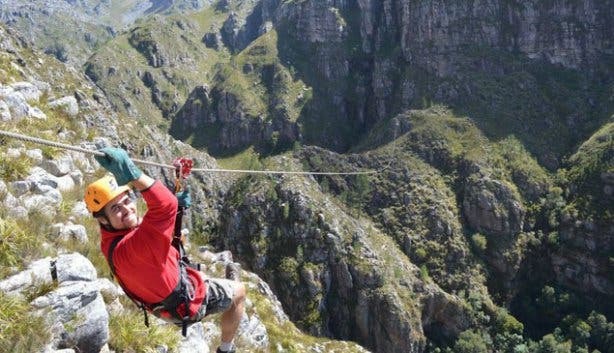 It’s been a while coming, but in early August 2014, a high-as-the-heavens canopy tour opened to the public in the mountains of the Hottentots Holland Nature Reserve in Elgin, a region that lies only a short one-hour highway glide away from the built-up skeleton of the city. 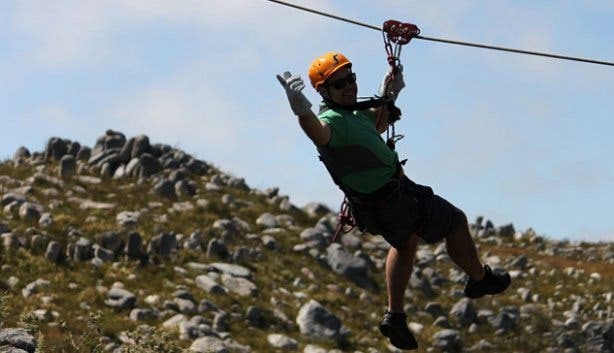 Of course, the mere addition of this spectacular zipline activity to the Western Cape’s repertoire is exciting enough, but the real drawcard is that it gives locals and tourists the chance to explore an untouched, untarnished part of the province that was previously completely unreachable (it’s not even possible to hike here). Eleven stainless steel slides (some up to 320m in length) and one lofty suspension bridge connect 13 wooden platforms that are built into rocky precipices never before seen by man, and thrill-seekers and nature lovers can spend a few solid hours soaring over pristine gorges and far-below running rivers that sit like sweet unspoiled secrets in one of the most stunning, well-preserved parts of South Africa. And appreciating the breathtaking surrounds is as much a part of the whole experience as the fun and excitement of flying through the clouds from one escarpment to the next. For this reason, the excursion is led by at least two professional guides from the local community who chat to patrons throughout the tour about the history of the area and the fauna and flora that unfolds in front of them. Of course, the chaperons are also there to ensure guests’ safety, an issue that’s taken very seriously throughout the expedition. 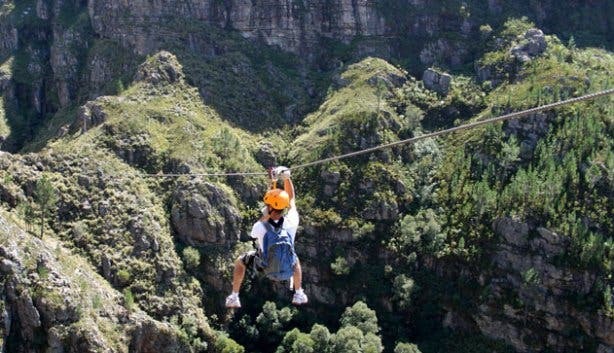 All adventurers are harnessed up and given an in-depth briefing before they’re taken up to the tippy-top of the often snow-capped mountains, all the equipment, which adheres to the highest safety standards, is regularly checked and double-checked and all kiddies are asked to ride in tandem with guides to keep them extra secure. Speaking of kids, anyone as young as five or six can do the tour, as long as they fit comfortably into a harness. And on the other side of the age spectrum, grans and grandpas of 80 and above are welcome – they just need to be able to manage the 1-km trek out of the valley and back to the 4x4 after all the slipping and sliding is done. The walk back should be easy, though, considering there’s extra motivation to return to reception: a tasty lunch (it’s included in the tour price) awaits groups back at base camp. 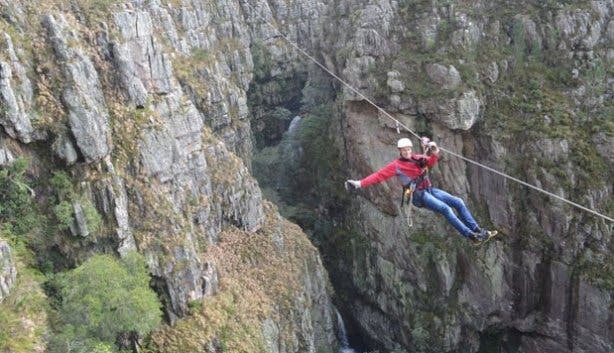 So, once zip liners have worked up quite the appetite from all the adrenaline, they can bring the experience to a close with food fit for an explorer while overlooking the very valley they sailed over just moments before. Tip: Be sure to bring along comfy shoes for the walking – avoid wearing flip-flops as these will likely fall off while you’re sliding. Also, make sure you have warm clothes on you as even on the sunniest days it can still be chilly up in the mountain peaks. 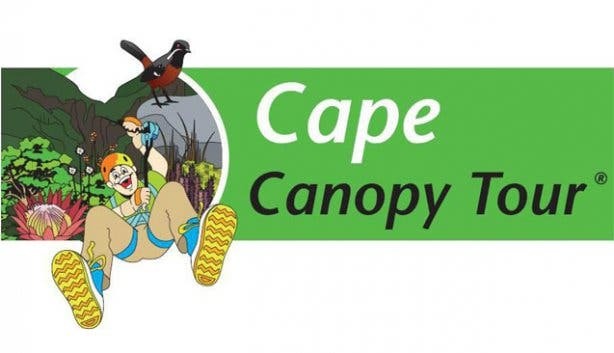 The Bill: The Cape Canopy Tour costs R595p/p, and this price includes snacks, lunch and a park conservation fee of R40. This fee is waivered for Wild Card holders, who then only have to pay R555. Keen for a more relaxed nature experience? 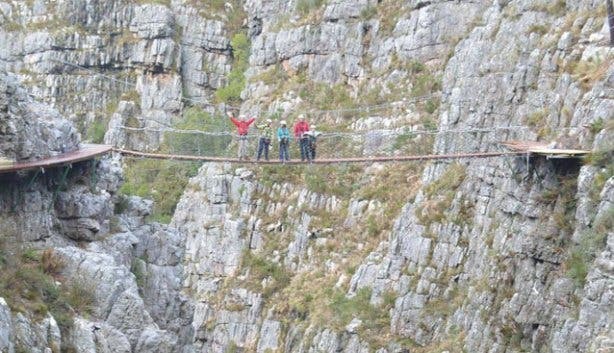 Consider a visit to the new treetop canopy walkway at Kirstenbosch.